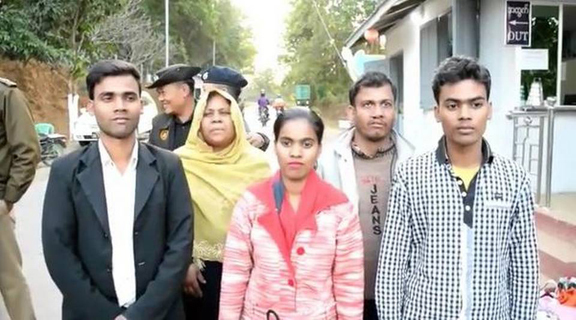 After deportation of seven Rohingyas to Myanmar from Assam through the Manipur border three months back, five members of a Rohingya family were handed over to the Myanmarese authorities on Thursday. A report published by The Hindu stated the five Rohingyas, who were deported on Thursday, had entered Assam illegally in 2014. they were deported to Myanmar through the Indo-Myanmar border at Moreh, a town in Manipur. The five Rohingyas, who have been identified as Mohammad Riyas, Ahmed Hussain, Mohammad Ayas, Toyaba Khatun and Azida Begum, as per the report, were from Buthitang area of Myanmar. It has been suspected that they had sneaked into India to escape ethnic violence in Myanmar. The Sonitpur district Superintendent of Police, PP Singh, on Wednesday said process was on to deport the five Myanmar nationals. “I can only tell you that the process is on to deport them,” Singh had said on Wednesday. An Assam police officer, on condition of anonymity said the Myanmar nationals were lodged in a detention centre for foreigners at Tezpur in Assam’s Sonitpur district. He also said the border police had liaised with officials in Manipur for verifying the addresses of the five with the Myanmar authorities. This is the second such deportation after seven Rohingyas, who were lodged in Assam’s Silchar jail, were sent back to Myanmar in October, 2018. The report quoted an Home Department official of Assam as saying that there are still 20 Rohingyas lodged in the Goalpara, Tezpur and Silchar detention centres. On the other hand, as per media reports, another Rohingya man, who entered India without papers and apprehended at Ambala in Haryana, was also deported to Myanmar through the Moreh border of Manipur on Wednesday. In the month of October last year, 7 Rohingyas, reportedly belonging to the Rakhine state of Myanmar, were deported through the Moreh border of Manipur. Those Rohingyas, who were nabbed by Assam police for violating Foreigners’ Act, were sent to the bar for three months in Silchar Jail. After the end of their jail terms, they were shifted to the detention camp within the jail, meant for foreigners. According to estimates, there are around 40,000 Rohingyas who are taking shelter in the country.